Prague, 20th December 2016 – Colliers International and Knight Frank have been appointed as Exclusive Letting Agents for Avenir Business Park in Prague 5 – Nové Butovice, a state-of-the-art office complex owned by Hudson, the first stage of which was completed in 2004. Avenir Business Park (Buildings A and B/C) offer a total of 23,480 sqm of Class A office space, currently offering slightly more than 9,000 sqm. Satisfying the latest requirements of modern office buildings, Avenir Business Park was awarded a BREEAM certificate for the property’s environmentally friendly design as well as excellent energy efficiency. Employees working in Avenir Business Park may enjoy two in-house canteens and a wide variety of other amenities, including a multitude of stores, service providers and catering establishments, located in the nearby Galerie Butovice shopping centre. In addition, Avenir Business Park features a generously sized car park with 425 underground parking spaces and an additional 100 surface parking spaces available also for visitors. Apart from numerous other benefits, tenants will greatly appreciate the location’s accessibility by public traffic with the proximity of the nearby Nové Butovice metro station. Situated close to two of Prague’s most important arterial roads – Radlická Street and Rozvadovská spojka – Avenir Business Park offers ease of access and great visibility, giving tenants an excellent opportunity to showcase their company logos on the buildings’ exterior. 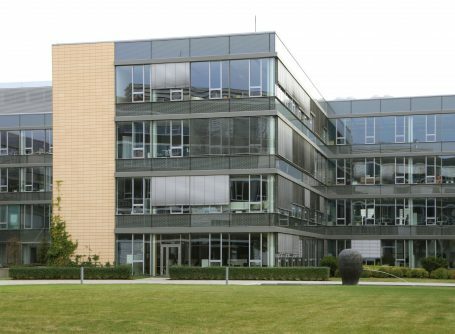 Avenir Business Park is home to many well-known companies, including ČSOB with more than 9,000 sqm of office space. Other tenants include a Porsche Engineering subsidiary focusing on comprehensive technical calculations and the development of electric cars, electronics and design, and Quintiles pharmaceutical company. “Avenir Business Park has managed to attract some very big names. To us this is clear proof that both the property and the location are very popular with clients and fully capable of consistently satisfying the needs of large tenants on a long-term basis,” says Pavel Novák, Head of Office Agency at Knight Frank. “Owing to its excellent transport accessibility and many other benefits, Prague 5 has been a very popular office location, boasting the highest long-term office space occupancy rates in the city. In the outer parts of Prague 5, including districts such as Nové Butovice, Jinonice, Stodůlky and Zličín, occupancy has remained above 94%. Compared to the average vacancy rate in Prague, of almost 12%, this is a strong indication of how attractive the area is for tenants,” explains Iva Caňková, Head of Office Agency at Colliers International.